I’ve been a huge blog slacker of late. I have craft projects to document, books to review, products to endorse … perhaps it’s just that I have too many choices, so I don’t know what to write about next. So I’ll dive back in with the easiest possible thing — catching up on my photodumps. First off, I finally bit the bullet and got some Skele-Toes. Yes, they’re the weird shoes with toes. And I have to say, I could walk FOREVER in these things. They’re the most comfortable athletic shoes I’ve ever owned. I even got a second pair in black. If you’ve ever been intrigued at all by these, but were put off by their price tag, see if you have a Finish Line store near you — they’re clearing these shoes out for $29. I went to their site the other day to get a second pair in pink, to put away in cold storage for when these wear out, but they’re out of my size. Oh well, I’ll have to care well for the ones I have. 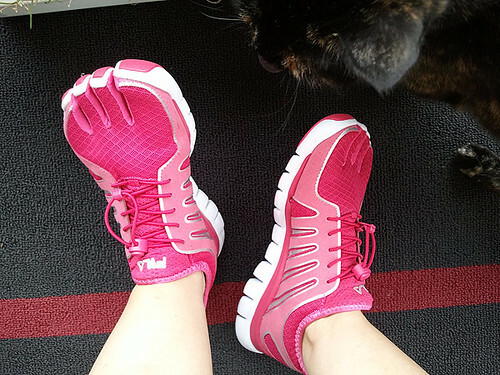 I did try on the Vibrams Five Fingers before I got these. Thing is, I like how the Skele-Toes put the two smallest toes together in their own pocket. For me, both of those toes were too stupid to easily make it into their own individual homes. Oh, and also, I got some of the super-thin athletic socks to wear with these. Though you could go barefoot in them too. We visited the Orlando Mini Maker Faire, where we saw lots of fun doodads and gewgaws. 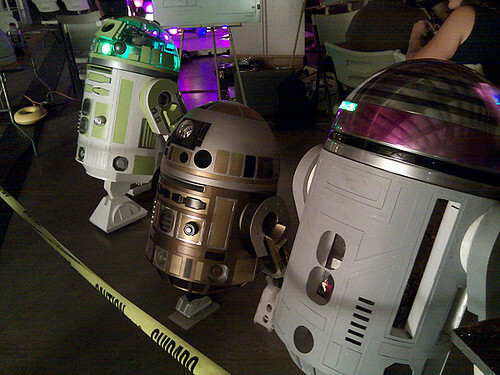 The local R2 builders’ group had many of their models out on display. I was especially taken by the bronzey guy in the middle here. He had a whiff of the steampunk to him. Disney opened up a brand new resort! The Art of Animation resort is mostly family suites, and a step above the regular value resorts. Cast members got a chance to tour the grounds and look inside some of the rooms, and I have to say, it’s really nice. We’ve only ever stayed at the value resorts ourselves, and this was a definite step up. We figured that we could see the grounds anytime, but this “open mouse” would be our only chance to really scout out the rooms. I’m glad we went — when else would I be able to get a panorama shot of the gigantic Nemo pool with only Scott in the frame? I got some lightweight pajama pants for summer. 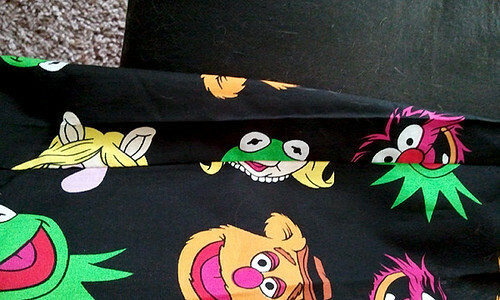 They had the Muppets on clearance at Old Navy, so how could I not? I took this picture because of the freakish Kermit/Piggy hybrid face in the center, but I didn’t notice until uploading the picture that the left-hand side has a really weird phallic Piggy-nose thing going on. Or is it just me seeing that? I’ve missed the Cash & Carry terribly — we have Costco and Sam’s Club and such here, but there wasn’t a convenient restaurant supply store … until now! 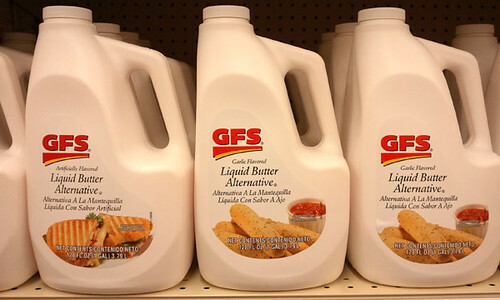 We just got a shiny new GFS Marketplace, and it’s everything that Cash & Carry was. But cleaner and more brightly lit. I didn’t purchase a bottle of liquid fake butter, sadly. But I did get a box of frozen gyros meat slices. And a huge pillow pack of pepperoni. And several pounds of saltwater taffy for my candy bucket at work. I’ve really missed those frozen gyros meat slices. Mmmmm. On the deliciousness front, one of my lemon trees turned out to be a lime tree. I finally picked the fruit to check it out, since it was taking FOREVER to turn yellow. Yeah, the joke was on me. So since I have no idea what kind of limes they are (the tree is labeled “Meyer lemon”), I call them mothereffing limes. Though I’m less ladylike about it. Anyhoo, the mothereffing lime is flowering again, and creating new leaves like crazy. 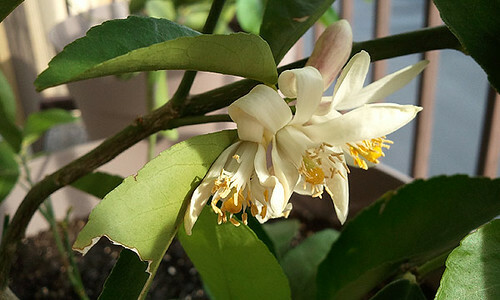 The Eureka lemon tree appears to actually be a genuine lemon tree, and it has two lemons growing on it. It’s also going crazy with the new leaves. The cats are doing well. We were having some flea problems, but Advantage appears to have them under control. We tried Frontline, but apparently Frontline is pretty much useless in our area — the fleas are all adapted to it. 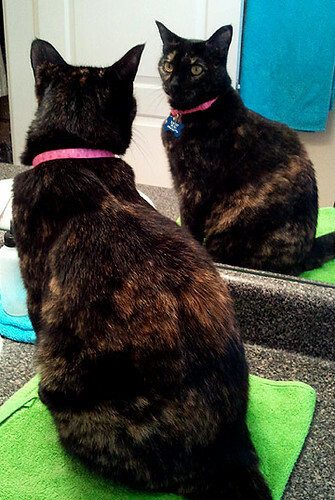 Commie is loafish as ever, and Trouble could stare for hours at the most beautiful cat in the world. I’m still playing Draw Something, but I’ll admit, I have so many games going that I don’t play them all as often as I’d like. I nibble away at them when I can. I’ve started trying to draw everything in under a minute, since part of the game is having to watch the other person’s drawing being created in real-time. And there’s nothing that makes me more insane than watching a drawing happening, guessing all the while, for five minutes or more, only to have the person finally draw the actual guessable item almost as an afterthought at the very end. I try to get the guessable part in there in under 30 seconds, then save the fine details for last. 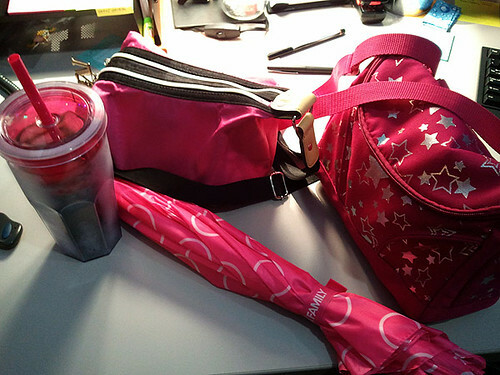 I realized as I put my stuff down on my desk the other day, I tend toward hot pink a lot. Not that there’s anything wrong with that, just an observation. 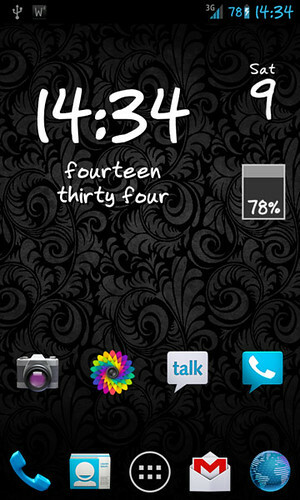 Last but not least, I’m running Ice Cream Sandwich on my phone, courtesy of CyanogenMod 9. It’s super-sleek and fast, and the ICS camera is even better than the stock Samsung camera I loved so much. All right, now that I’ve emptied the photodump tank, I can move on to various other things waiting in the blog queue. good to have you back, I like glimpses into your world. Apart from the cat, you may as well be on a different planet in a far-away galaxy …….but it’s great to read about it. Hope your guts are behaving. My guts are great! I’m off all medication, getting plenty of vitamin D thanks to the Florida sun, and staying away from wheat. No Crohn’s problems at all — even the arthritis is tamed by the hot and humid weather (in Seattle, the dry coldness was a huge trigger). Those shoes! Dang it, now I want a pair! I have difficult-to-fit feet, though, alas…. I don’t know how weird your feet are, but mine are quite wide and sprawling, and they’re comfy for me. Scott, however, has really slender feet with freaky toes, and he got a pair too. So they’re definitely worth a try either way. 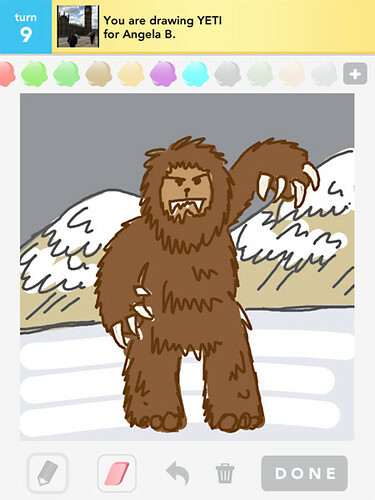 It’s been fun playing Draw Something with you! I actually think it’s very fun to watch other people draw things in real time. I enjoy seeing different techniques that people use to draw, and I like to see the effort that goes into drawings. I’ve drawn comics most of my life, that and being colour-blind kind of define the reason I draw things the way I do. (and if you’ve ever wondered why the heck I chose a certain colour, now you know why. I wish I could un-buy some of the colours that I can’t distinguish between.) However, I really enjoy seeing how other people use different artistic skills to draw things. I think a lot of the fun of the game comes from watching people figure out my drawing, and watching people draw in real time. I don’t actually like the latest update that speeds things up and shows people guessing the words faster than they actually do, but that’s because I like to watch how people guess and try to draw accordingly. For the people who like to guess as quick as they can, I like to draw quicker, and for the people that like to see me draw, I like to take some time to do a quality drawing. On the flipside, if I see someone is putting a good effort into their drawing, I’ll usually wait until they finish before guessing the word, even if I know what it is. But if I figure out a drawing that seems to be kind of lame, I have no problem guessing right away. But I do have to agree that I’m not a huge fan of people drawing something completely irrelevant, and then putting on the finishing touch that is an easy word. Anyways, thanks for taking the time to play the game! You’re one of the best artists I play with! If only they’d put a slider, so we could choose our speed! (And a paint bucket, so you could do the whole screen one color.) And I’m still confused over the specialty words thing, since I don’t appear to have earned the extra coins they promise when I use them. Hmmmm!